Dendritic cells are thought to regulate tolerance induction vs immunization by transferring Ags and peripheral signals to draining lymph nodes (LN). However, whether myelin Ag transfer and presentation in LN occurs during demyelinating brain disease is unknown. In this study, we demonstrate redistribution of autoantigens from brain lesions to cervical LN in monkey experimental autoimmune encephalomyelitis (EAE) and in multiple sclerosis (MS). Immunohistochemical analysis revealed significantly more cells containing myelin Ags in cervical LN of monkeys with EAE compared with those of healthy control monkeys. Myelin Ags were observed in cells expressing dendritic cell/macrophage-specific markers, MHC class II, and costimulatory molecules. Moreover, these cells were directly juxtaposed to T cells, suggesting that cognate interactions between myelin-containing APC and T cells are taking place in brain-draining LN. Indeed, myelin Ag-reactive T cells were observed in cervical LN from marmosets and rhesus monkeys. Importantly, these findings were paralleled by our findings in human tissue. We observed significantly more myelin Ag-containing cells in LN of individuals with MS compared with those of control individuals. These cells expressed APC markers, as observed in marmosets and rhesus monkeys. These findings suggest that during MS and EAE, modulation of T cell reactivity against brain-derived Ags also takes place in cervical LN and not necessarily inside the brain. A major implication is that novel therapeutic strategies may be targeted to peripheral events, thereby circumventing the blood-brain barrier. Current views on the initiation of primary immune responses hold that dendritic cells (DC)3 transfer Ags from peripheral tissues into secondary lymphoid organs, where they activate or make tolerant naive lymphocytes, depending on the nature of the Ag and peripheral stimuli (1, 2, 3, 4, 5, 6, 7). Although this concept is now fairly well established for model immunogens, microbial Ags, and apoptotic cell material, far less is known about transfer and presentation of autoantigens in vivo during chronic inflammatory disease. Autoimmune responses directed against myelin components are considered to be pivotal in the development and perpetuation of multiple sclerosis (MS), but the nature of the events leading to the activation of autoreactive lymphocytes is largely unclear. This concerns both the anatomical site of Ag presentation and the features of APC involved. These issues are particularly relevant in relation to the continuous broadening of the autoimmune response during chronic MS (8, 9), a phenomenon known as epitope spreading. T cell reactivity is directed initially toward a narrow set of myelin epitopes, but spreads to other epitopes on the same Ag (intramolecular spreading) or to other myelin Ags (intermolecular spreading). The pathogenic significance of this process has been demonstrated in relapsing experimental autoimmune encephalomyelitis (EAE) in mice (10, 11, 12, 13). The mechanism underlying epitope spreading is thought to involve APC that present degraded myelin derived from the inflammatory process in the CNS, but it is unknown where this presentation occurs. The CNS has long been regarded as an immune-privileged site sequestered from the immune system by the blood-brain barrier and the lack of lymphatic vessels, but it is now clear that Ags and cells injected into the brain drain to secondary lymphoid organs (14, 15, 16). Outflow of Ags from the brain occurs by interstitial fluid and cerebrospinal fluid drainage to lymphoid organs via various pathways. Ags in these fluids can drain via the blood to the spleen, can escape along cranial nerves into the nasal lymphatics and drain to the cervical lymph nodes (LN), and can escape along spinal nerves to other LN. The objective of this study was to determine whether myelin Ag-containing APC are present in the cervical LN of monkeys with EAE or individuals with MS and whether they might be involved in modulation of T cell reactivity. Improved insight into these mechanisms will elucidate tolerance induction vs autoimmunity and facilitate the rational development of immunotherapy of demyelinating disease. We investigated the possible transfer and presentation of myelin Ags in lymphoid organs during a demyelinating inflammatory process in the CNS in nonhuman primates and in MS. The EAE model in common marmoset monkeys (Callithrix jacchus jacchus) mimics human MS in its clinical presentation and in the radiological, neuropathological, and immunological aspects of its brain white matter lesions (17, 18, 19, 20). The close phylogenetic relationship of marmosets and humans makes EAE in this species a unique experimental system for detailed analysis of MS immunopathogenesis. Moreover, this outbred model has several useful features, including 1) a 100% incidence of disease, which results from presentation of an encephalitogenic peptide by a monomorphic MHC class II molecule (21), 2) primary demyelination occurring after immunization with whole human myelin or with recombinant human myelin oligodendrocyte glycoprotein (rhMOG), 3) intramolecular and intermolecular epitope spreading of the cellular and humoral immune response (21, 22), and 4) the complete disease spectrum being based on the intricate interplay between APC, T cells, macrophages, and plasma cells (19, 23). In parallel to lymphoid organs of marmosets, we investigated cervical LN of rhesus monkeys (Macaca mulatta) with acute EAE induced by myelin oligodendrocyte glycoprotein (MOG) immunization (24) and cervical LN from MS and control patients. Lymphoid organs and brain were isolated from common marmosets, rhesus monkeys (M. mulatta), and cynomolgus monkeys (Macaca fascicularis) raised at the Biomedical Primate Research Center (Rijswijk, The Netherlands), the German Primate Center (Göttingen, Germany), and Inveresk (Tranent, U.K.), as described previously (21, 24), under conditions approved by the Dutch, German, and British law, respectively, on animal experimentation. All experimental procedures were approved by local Institutional Animal Care and Use Committees. Tissues were obtained from animals that were used for studies designed for other purposes, thus avoiding sacrifice of animals for the purpose of the present study only. EAE was induced in marmoset monkeys by immunization with 20 mg human whole myelin or 0.1 mg rhMOG emulsified in CFA as described (17, 21). Adjuvant control marmosets were immunized with 1 mg OVA (Sigma-Aldrich, St. Louis, MO) in CFA. Emulsions were injected into the dorsal skin at four different sites; two injections were given in both the inguinal and axillary LN regions. EAE was induced in rhesus monkeys by immunization with 0.32 mg rhMOG or 0.1 mg MOG34–56 (human MOG peptide (phMOG)) in CFA as described (24). The MOG/CFA emulsion was injected into the dorsal skin at 10 different spots on the back. Adjuvant control rhesus monkeys were immunized with 3–5 mg bovine type II collagen in CFA as described (25). All myelin Ag-immunized animals were examined daily for clinical symptoms of EAE by a trained observer. Brain inflammation was visualized by magnetic resonance imaging and/or (immuno-)histochemistry as described previously (17, 26). According to these examinations, all animals immunized with myelin Ags had clinically active EAE and inflammatory foci in their brain at the time of necropsy. Deep cervical LN and spleens were isolated from animals sacrificed by an i.v. injection of pentobarbital during deep ketamine sedation. In addition, axillary and inguinal LN, draining the immunization sites, were isolated for comparison. All lymphoid tissues were immediately frozen in liquid nitrogen and stored at −80°C until use. Human cervical LN (one to five per patient) were taken from two patients with chronic MS and two control patients at autopsy, and were provided by the Netherlands Brain Bank. Control patient S01/216 died of cancer of the urinary tract, whereas control patients S01/228 was diagnosed with hereditary motor and sensory neuropathy type 1. After removal, LN were snap frozen in liquid nitrogen and stored at −80°C until use. From each patient, at least five sections were stained for each marker for quantification. Myelin degradation products were detected with oil-red O (ORO), which stains neutral lipids, as previously described (27). Neutral lipids as visualized by ORO are not just a marker for degraded myelin, but are relevant to pathogenesis, because self glycolipids are T cell autoantigens in MS (28). Briefly, cryosections (6 μm) were stained with 0.3% (w/v) ORO (Gurr, London, U.K.) in 60% 2-propanol and counterstained with hematoxylin. Acid phosphatase, a marker of macrophages, was detected in acetone-fixed sections, as previously described (29), using naphtol-AS-BI-phosphate (Sigma-Aldrich) as substrate. Immunohistochemistry was performed as described previously (26, 30) with slight modifications. Sections were fixed in 4% paraformaldehyde in PBS (pH 7.4) and treated with 0.02% (v/v) H2O2 in PBS to eliminate endogenous peroxidase activity. Any remaining endogenous peroxidase activity was demonstrated with 4-chloro-1-naphthol (dark blue reaction product; Sigma-Aldrich). Sections were incubated with primary Abs overnight in humidified atmosphere, followed by biotinylated-secondary Abs for half an hour and HRP-conjugated avidin-biotin complex (ABC-HRP; DAKO, Glostrup, Denmark) for 1 h. Labeled cells were stained with either 3-amino-9-ethylcarbazole (red reaction product; Sigma-Aldrich) or diaminobenzidine (brown reaction product; Sigma-Aldrich). Finally, sections were counterstained with hematoxylin and embedded in glycerol-gelatin. Double-labeling of cells was performed, as described previously (30), with alkaline phosphatase-conjugated secondary Abs and a substrate solution containing Fast Blue BB Base (blue reaction product; Sigma-Aldrich). The primary Abs used for immunohistochemistry were polyclonal rabbit anti-bovine myelin basic protein (MBP; kindly provided by Dr. J. Bajramoviç, Netherlands Organization for Applied Scientific Research (TNO), Prevention and Health, Leiden, The Netherlands), rabbit anti-CD3 (DAKO) and mAbs directed against the encephalitogenic epitope of proteolipid protein (PLP) in SJL/J mice, i.e., PLP139–151 (J1/03; Ref. 31), MHC class II (L243; BD Biosciences, San Diego, CA), and the APC markers CD40 (5D12; Tanox Pharma, Amsterdam, The Netherlands), CD68 (KP-1; DAKO), CD83 (HB15A; Immunotech, Westbrook, ME), CD86 (1G10; kindly provided by Innogenetics, Gent, Belgium), DC-SIGN (AZN-D1; kindly provided by Dr. Y. van Kooyk, University Medical Center St. Radboud, Nijmegen, The Netherlands), and CCR7 (2H4; BD PharMingen, San Diego, CA). Secondary biotinylated Abs were rabbit-anti-mouse Ig (DAKO), donkey-anti-rabbit Ig (Amersham, Buckinghamshire, U.K.), horse-anti-mouse Ig (Vector Laboratories, Burlingame, CA), alkaline-phosphatase conjugated rabbit-anti-mouse Ig, goat-anti-rabbit Ig (both from DAKO), and rabbit-anti-goat Ig (Southern Biotechnology Associates, Birmingham, AL). To calculate the number of ORO-, anti-MBP-, or anti-PLP-stained cells per square millimeter in cervical LN sections, the cells were counted and the area of the sections was determined using a VIDAS-RT image analysis system (Kontron Elektronik/Carl Zeiss, Weesp, The Netherlands). Area measurements were performed using a 2.5-fold magnification objective. Proliferation assays with cervical LN cells were performed essentially as previously described (21, 32). Briefly, LN cell suspensions were prepared from aseptically removed cervical LN from sacrificed marmoset and rhesus monkeys with EAE. LN cells were cultured with 10 μg/ml rhMOG or phMOG in HEPES-buffered RPMI 1640 (Life Technologies, Glasgow, U.K.) supplemented with 10% FCS (Flow Laboratories, McLean, VA), 10 mM MEM with nonessential amino acids, 2 mM l-glutamine, 100 U/ml penicillin G, 100 μg/ml streptomycin, and 2 × 10−4 M 2-ME (all from Life Technologies). Marmoset cervical LN cells were restimulated with EBV-transformed autologous B cells and 10 μg/ml rhMOG. Proliferation of marmoset cervical LN cells was tested after one or two rounds of restimulation, whereas proliferation of rhesus cervical LN cells was tested directly after the first round of stimulation. Marmoset and rhesus LN cells (2 × 104 cells/well) were seeded with or without relevant Ag in the presence of EBV-transformed autologous B cells (2 × 104 cells/well) or irradiated spleen cells (2 × 105cells/well), respectively, in 96-well flat-bottom plates (Greiner, Solingen, Germany) for 48 h and subsequently pulsed with 0.5 μCi [3H]thymidine for 18 h. [3H]thymidine incorporation was measured in a matrix 9600 beta-counter (Packard, Meriden, CT). Differences in the number of myelin Ag-containing cells in cervical LN between treatment groups were determined by a two-tailed Mann-Whitney test. The number of stained cells in the axillary and inguinal LN and spleen per visual field was scored using a 10-fold objective in a semiquantitative manner as: −, no positive cells; +/−, 1–5 positive cells; +, 6–20 positive cells; ++, 21–50 positive cells; or +++, >50 positive cells. To investigate the drainage of myelin degradation products to secondary lymphoid organs during active inflammation of the CNS, as well as under normal physiological conditions, brain tissue, different LN, and spleens were isolated from nonimmunized marmoset and cynomolgus monkeys, from marmoset and rhesus monkeys immunized to develop EAE, and from adjuvant control marmoset and rhesus monkeys. According to clinical, radiological, and (immuno-)histochemical examination, all myelin Ag-immunized monkeys possessed cellular infiltrates in the CNS at the time of sacrifice (data not shown). (Immuno-)histochemical analysis of inflammatory foci in EAE brains showed the presence of ORO-positive cells (Fig. 1⇓A), i.e., cells containing neutral lipids as a result of myelin degradation, and PLP-containing cells (Fig. 1⇓B), similar to previous findings in marmoset EAE (17). In this respect, the neuropathology of marmoset EAE closely mimics the situation in MS, where abundant ORO-positive cells are also found in active brain lesions (33, 34). 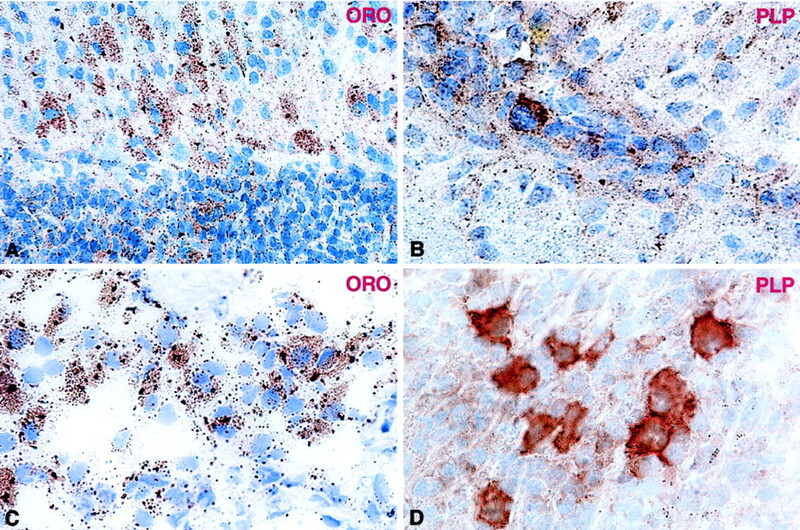 In the EAE lesions, both ORO and PLP staining were found mainly in the cytoplasm of large cells with a morphology closely resembling macrophages. Furthermore, EAE lesions contained numerous cells expressing MHC class II, acid phosphatase, CD40 (26), and CD83 (data not shown), indicative of the presence of APC. Myelin Ag-containing cells in brain and brain draining LN. In situ analysis of myelin Ag-containing cells in brain (A and B) and cervical LN (C and D) from marmosets with MOG-induced EAE. A, Cells containing neutral lipids, stained red by ORO, were found in the brain parenchyma marmosets with EAE. B, Cells containing the myelin protein PLP were observed in brain parenchyma. C, ORO-positive cells were found in cervical LN of marmosets with EAE. D, Macrophage-like cells containing myelin proteins were also present in the cervical LN as demonstrated by PLP staining. Magnification: A, ×315; B–D, ×500. To determine whether myelin Ags gain access to brain-draining lymphoid organs during demyelinating EAE, sections of cervical LN and spleen were stained with ORO to detect degraded myelin lipids, with a polyclonal antiserum against MBP, or with a mAb against PLP139–151, a classical encephalitogenic epitope in SJL/J mice. In the cervical LN of both myelin- and MOG-immunized marmosets, a large number of ORO- and PLP-positive cells were detected (Fig. 1⇑, C and D, respectively). Thus, in marmosets with EAE, myelin Ags are observed not only in the brain, as expected, but also in brain-draining cervical LN. To investigate whether the presence of myelin APC correlates with the presence of demyelinating CNS disease, the number of ORO-positive cells in cervical LN of marmosets with EAE induced by human whole myelin or rhMOG immunization was compared with those found in healthy control monkeys. A striking difference was found in the number of ORO-positive cells, which were detected in nine of 10 marmosets with EAE, but in none of the untreated marmosets (p < 0.05) (Fig. 2⇓A). 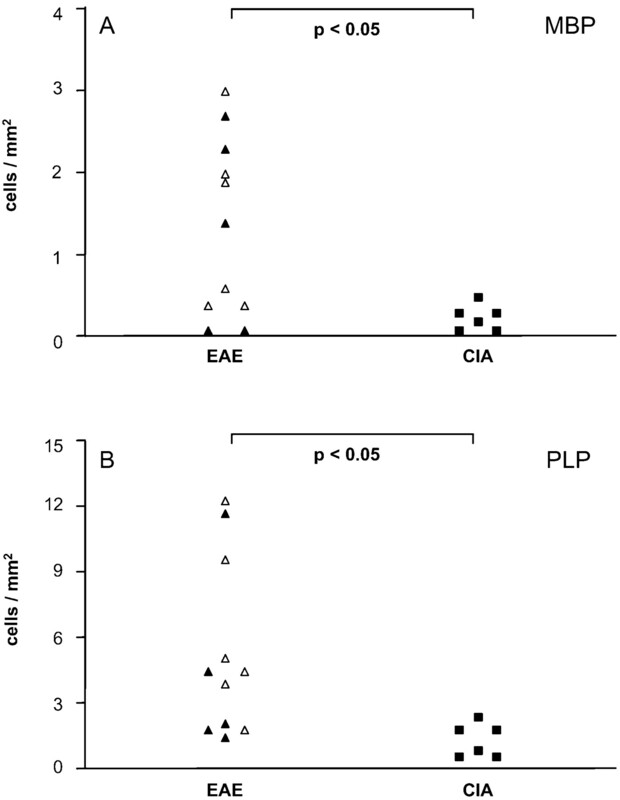 Moreover, a significantly higher number of MBP- and PLP-containing cells was observed in the cervical LN of marmosets with EAE as compared with those of the control group (p < 0.05) (Fig. 2⇓, B and C). Myelin Ag load in marmoset cervical LN. 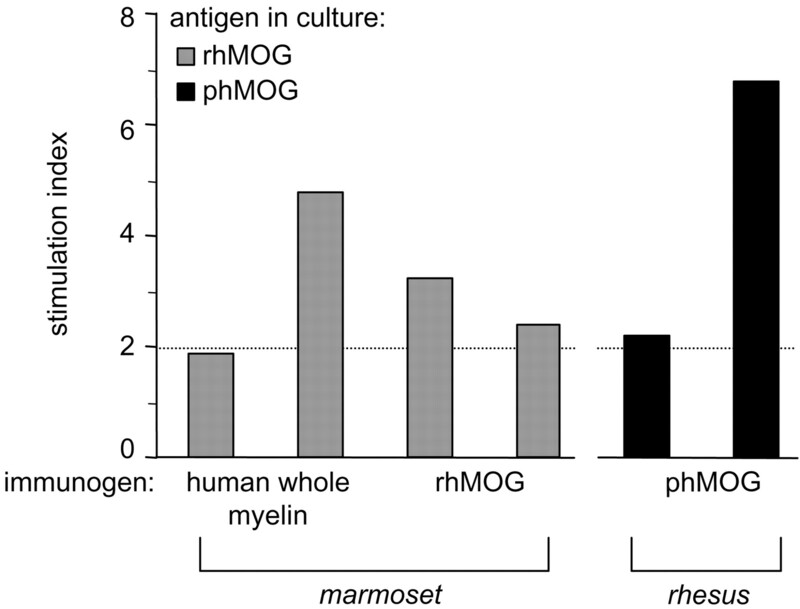 The density of cells containing neutral lipids stained by ORO (A), MBP (B), and PLP (C) in cervical LN of marmosets with EAE, immunized with either human whole myelin (○) or rhMOG (▵), was compared with that of healthy marmoset monkeys. Significantly more ORO-, MBP-, and PLP-containing cells were observed in cervical LN of marmosets with EAE as compared with those of control marmosets (p < 0.05). The number of cells per surface area was determined by counting stained cells and measuring the area of the sections at 2.5-fold magnification using the VIDAS-RT image analysis system. Next, we compared the presence of myelin Ags in cervical LN of rhesus monkeys with EAE or collagen-induced arthritis, to exclude the possibility that myelin Ags were present in these LN as a result of the administration of adjuvant. We chose to examine the LN of rhesus monkeys, because we were unable to retrieve them from marmoset monkeys immunized with OVA in adjuvant. Strikingly, the number of MBP- and PLP-containing cells was markedly higher (p < 0.05) in the LN of rhesus monkeys with EAE induced by rhMOG or phMOG immunization as compared with those of the adjuvant control animals (Fig. 3⇓, A and B). However, ORO-positive cells were not detected in cervical LN of rhesus EAE and control monkeys. Furthermore, a paucity of myelin Ag-containing cells was found in cervical LN (n = 10) of normal cynomolgus monkeys, a species related to rhesus monkeys (data not shown). MBP- and PLP-containing cells in rhesus cervical LN. Cervical LN of rhesus monkeys with EAE, immunized with rhMOG (▵) or phMOG (▴), were compared with those of adjuvant controls with collagen-induced arthritis (CIA). 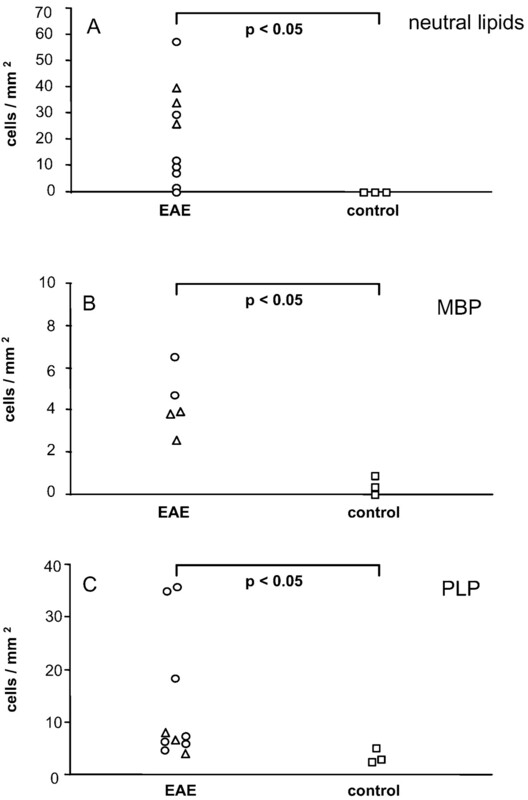 Significantly more MBP- and PLP-positive cells were observed in cervical LN of rhesus monkeys with EAE as compared with those of OVA-immunized control monkeys. The number of MBP-containing cells (A) and PLP-containing cells (B) per surface area was determined as described in the legend for Fig. 2⇑. Together, these results demonstrate that myelin Ags in the cervical LN result from the demyelination of the CNS and not from the immunization itself, nor from normal myelin turn-over or local neurons innervating the LN. The finding that MBP and PLP are present in the cervical LN of marmoset and rhesus monkeys immunized with MOG only, shows that myelin Ags in this lymphoid organ are derived from the inflamed CNS rather than from the injected emulsion. Most myelin Ag-containing cells in the cervical LN of marmoset and rhesus monkeys with EAE were detected in the medulla. However, some myelin Ag-containing cells were found in the subcapsular sinus, the site where leukocytes enter the LN with the afferent lymph, and in extrafollicular areas of the cortex, the site where interaction of APC with T cells occurs (data not shown). Myelin Ags were found mostly in the cytoplasm of large cells with a morphology resembling macrophages, similar to the findings in the brain. Indeed, most MBP- and PLP-positive cells expressed macrophage markers, including the lysosomal enzyme acid phosphatase (AP, Fig. 4⇓A) and CD68 (Fig. 4⇓B). To determine whether myelin Ag-containing cells in the cervical LN of monkeys with EAE represented cells with the potential to present Ags to CD4+ T cells, double-labeling studies were performed with Abs cross-reactive with marmoset (MHC class II, CD40, CD83) and rhesus (CD40, CD86, DC-SIGN, CCR7) surface molecules. Myelin-containing cells displayed features of professional APC, including expression of the DC markers CD83 (Fig. 4⇓C) and DC-SIGN (Fig. 4⇓D), that are essential in DC-induced T cell proliferation (35, 36). 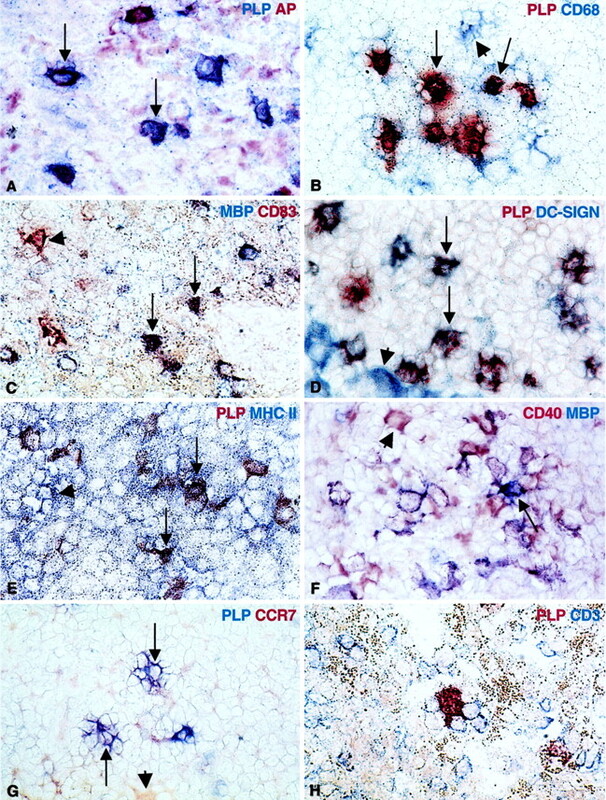 Staining for both acid phosphatase activity and CD83 revealed many double-positive cells in the cervical LN (data not shown), indicating that macrophage and DC markers are coexpressed by cells loaded with myelin Ags. The majority of MBP- and PLP-containing cells in the cervical LN also showed cell surface expression of MHC class II (Fig. 4⇓E) and of the costimulatory molecules CD40 (Fig. 4⇓F) and CD86 (not shown). In addition, myelin Ag-containing cells expressed the chemokine receptor CCR7 (Fig. 4⇓G) and the receptor for the LN-derived chemokines CCL19 (MIP-3β or ELC) and CCL21 (6-C-kine or SLC) driving DC migration (37). Myelin Ags are present in immunocompetent APC in cervical LN. Myelin Ag-containing cells in cervical LN of marmosets with EAE (A, C, E, F, and H) or rhesus monkeys with EAE (B, D, and G) were characterized by (immuno-)histochemical procedures. APC markers were stained in combination with staining for MBP or PLP (no counterstaining). A, Most PLP-containing cells (blue) also express the macrophage marker acid phosphatase (red, arrows). B, In the rhesus cervical LN, many PLP-containing cells (blue) expressed the macrophage marker CD68 (red). Double-labeled cells are indicated with arrows, a single CD68+ cell is indicated with an arrowhead. 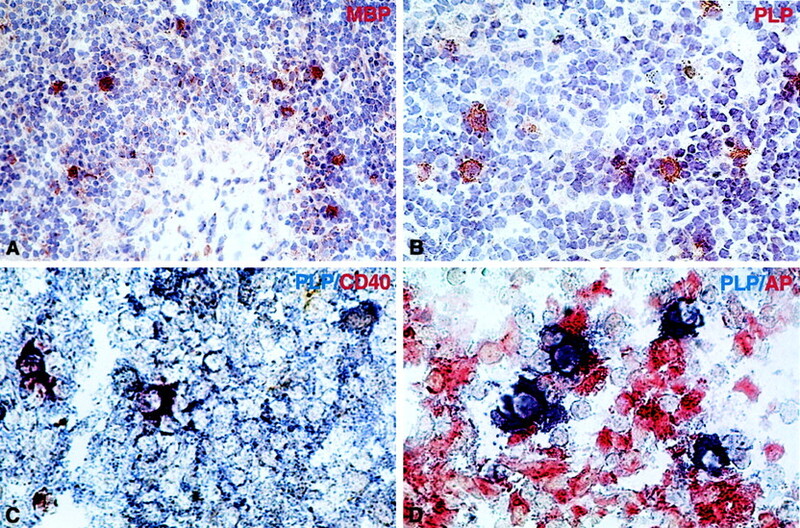 C, Double-labeled cells for MBP (blue) and CD83 (red) are frequently found (arrows) but single-stained cells are also observed (CD83, arrowhead). D, Besides CD83 expression, the majority of PLP-containing cells (blue) also express DC-SIGN (red); double-positive cells are stained purple. E, Cell surface expression of MHC class II (stained blue) was found throughout the LN and a subset of class II-positive cells contain myelin Ags (PLP, red). Double-labeled cells are indicated with arrows, and single-stained cells (MHC II) with arrowheads. F, Expression of CD40 (red) and CD86 (not shown) was found on most myelin Ag-containing cells (MBP stained blue) Double-labeled cells are indicated with arrows, single-stained cells (CD40) with arrowheads. G, Example of CCR7 expression (red) on a PLP-containing cells (blue). H, Myelin-containing cells (PLP stained red) were found in direct contact with CD3+ T cells (blue). Magnification: A–H, ×500. To assess whether myelin Ag-containing APC colocalized with T cells, indicative of cognate interaction, double-labeling for PLP and CD3 was performed on cervical LN of monkeys with EAE. In the medulla, numerous PLP-positive cells were found in juxtaposition with T cells (Fig. 4⇑H). PLP-containing cells were also found in the subcapsular sinus at the border of the T cell area and occasionally within the T cell areas of the cervical LN. These results demonstrate that myelin Ags are present in the cervical LN in cells that have the characteristics of mature professional APC and that are in direct contact with T cells. To determine whether cervical LN contain myelin-specific T cells besides myelin Ag-containing APC, cervical LN cells of marmoset and rhesus monkeys with EAE were tested for MOG-specific proliferative responses. Because primary cervical LN cells showed low proliferative responses as expected, proliferation was determined after a primary stimulation or after one or two rounds of restimulation. Positive responses (stimulation index >2) were found with cervical LN cells from three of four marmosets and all rhesus monkeys (Fig. 5⇓), indicating that myelin-specific T cells are present in these brain-draining LN. Myelin Ag-specific T cells in cervical LN of monkeys with EAE. MOG-specific responses of cervical LN T cells of six individual marmoset and rhesus monkeys with EAE induced by immunization with human whole myelin, rhMOG, or phMOG. Cervical LN cells were cultured with 10 μg/ml rhMOG or phMOG. Rhesus cervical LN cells were tested after primary stimulation, whereas marmoset cervical LN cells were assayed after one or two rounds of restimulation. The specific proliferative responses are expressed as the stimulation index, defined as cpm in cultures with 10 μg/ml Ag divided by cpm without Ag. Dotted line indicates stimulation index of two; stimulation indices of >2 were considered relevant. In addition to the cervical LN, the spleen and the axillary and inguinal LN of marmoset monkeys were analyzed for the presence of myelin components to determine whether myelin Ags gain access to other secondary lymphoid organs (Table I⇓). ORO-positive cells were detected in none of the spleens of myelin- or rhMOG-immunized marmosets, nor in those of OVA-immunized marmosets or untreated monkeys. However, a significant number of PLP-containing cells and a few MBP-containing cells were detected in the red pulp and around vessels within the spleens of marmosets with EAE. In contrast, the spleens of adjuvant controls and untreated monkeys were almost completely devoid of cells containing MBP and PLP. These results provide further evidence that myelin Ags gain access to brain-draining lymphoid organs as a direct result of CNS inflammation. Analysis of axillary and inguinal LN from myelin Ag-immunized and OVA-immunized marmosets revealed a complete absence of ORO-positive cells (Table I⇑), similar to the findings in the spleen. Comparable small-to-moderate numbers of cells containing MBP and PLP were detected in the LN of marmosets with EAE as well as adjuvant control marmosets. These results indicate that myelin Ags in these LN, which drain the immunization sites, may result from a response to the adjuvant administration rather than from the inflammatory process in the CNS. To determine whether the findings in two nonhuman primate EAE models appropriately reflect events in MS, we examined cervical LN of two MS patients with active disease and those of two control patients for the presence of myelin Ags. Cervical LN from both MS patients contained cells loaded with MBP and PLP (Fig. 6⇓, A and B, respectively). As in rhesus EAE, ORO staining revealed a paucity of cells containing neutral lipids from degraded myelin. Myelin Ag-containing cells expressed APC markers such as CD40 and acid phosphatase (Fig. 6⇓, C and D, respectively). Importantly, significantly more PLP-containing cells were observed in the cervical LN of both MS patients compared with those of both control patients (Table II⇓) (p < 0.005). The same pattern was observed for MBP. However, although more MBP-containing cells were observed in MS patients, this was not significantly more than control patient S01/216. Interestingly, control patient S01/218, who suffered from peripheral neuropathy, did have significantly fewer MBP-containing cells compared with both MS patients (p < 0.05). These results imply that, during MS, the presence of intracellular myelin Ags in APC is not restricted to the brain but is also found in APC in cervical LN, similar to what was observed with marmoset and rhesus EAE. Myelin Ag-containing cells are present in cervical LN of MS patients. Cervical LN of MS patient with active disease contain numerous cells loaded with MBP (A) and PLP (B). PLP-containing cells express APC makers such as CD40 (C) and acid phosphatase (D). Sections shown in A and B are counterstained with hematoxylin. Magnification: A and B, ×315; C and D, ×500. Autoimmunity toward myelin and other CNS components is considered to play a pivotal role in the development and perpetuation of MS, but the anatomical site of Ag presentation and the type of APC involved in the activation of autoreactive lymphocytes is still largely unclear. In this study, we explored the redistribution of myelin components during demyelinating EAE in nonhuman primates and MS, and characterized the cells loaded with myelin Ags in the draining LN. Using demyelinating EAE models, we demonstrated that 1) myelin Ags (neutral lipids, MBP, and PLP) are present in brain-draining lymphoid organs as a result of a demyelinating process in the CNS, 2) myelin Ag-containing cells display characteristics of professional APC, 3) myelin Ag-containing cells are in direct contact with T cells, and 4) myelin Ag-reactive T cells are present at this site. These results indicate that myelin Ags do not remain sequestered behind the blood-brain barrier during EAE but are transferred to sites that are optimally equipped for priming of myelin-specific T and B cells. Moreover, these data strongly suggest that cognate interactions between these myelin-containing APC and T cells take place in brain-draining lymphoid organs such as the cervical LN. Subsequently, reactivation of myelin-specific Ag-experienced T cells occurs locally in the CNS by virtue of resident APC-presenting myelin proteins (38, 39). Importantly, we also observe significantly more myelin Ag-containing cells in cervical LN of patients with MS compared with those of control patients, suggesting a similar role of cervical LN in the regulation of T cell responses. However, in this study, only a limited number of human cervical LN were available for analysis and more tissues should be assessed in the future. Recently, we have provided evidence that MOG-induced EAE in marmosets is associated with intramolecular epitope spreading of the T cell response (21). MOG-induced EAE is initiated by the presentation of an encephalitogenic peptide of the extracellular domain of MOG (MOG14–36) in the context of a monomorphic Mhc-DR molecule, Caja-DRB*W1201 (21). This disease-initiating step is followed by spreading to other MOG epitopes. The present finding that cervical LN of MOG-immunized marmoset and rhesus monkeys contain cells loaded with MBP and PLP strongly suggests that the priming of lymphocytes specific for (intramolecular and intermolecular) spreading epitopes takes place in this brain-draining LN. The observed difference in myelin content of cells in the cervical LN of marmoset vs rhesus monkeys may be related to the different pathogenesis of EAE in these species; although the exact mechanisms underlying myelin breakdown in rhesus and marmoset EAE are unknown, rhesus EAE is characterized by acute inflammatory necrosis of the white matter with profound influx of granulocytes, rather than chronic demyelination (40). Local release of granulocyte enzymes and reactive oxygen species may affect myelin degradation. Alternatively, the differential persistence of myelin lipids within cells may result from species differences in the intracellular degradation process. Active demyelinating lesions in both MS patients and marmosets with EAE are characterized by activated macrophages loaded with neutral lipids from degraded myelin, MBP, and PLP (17, 33, 34, 41), of which the eventual fate is unclear. Furthermore, MBP levels in CSF are elevated during relapsing-remitting MS (42). Studies tracing the outflow pathways of the brain in healthy animals revealed that both injected cells (macrophages and lymphocytes) and injected proteins and other substances drain preferentially to the cervical LN (14, 15, 43, 44). These findings imply that the myelin Ags found in the cervical LN within cells with DC- and macrophage-like characteristics (Figs. 1⇑ and 4⇑) have been ingested in the LN or have been transported from the brain to the LN by phagocytic cells, such as brain “resident” microglia, perivascular cells, DC from the meninges or choroid plexus (16, 38), or brain-infiltrated DC and macrophages. The latter notion is supported by studies on inflammatory responses in the kidney (45) and peritoneal cavity (46), which demonstrated that, during inflammatory conditions, macrophages migrate from these sites to the draining LN. Interestingly, Randolph et al. (4) showed, in an elegant in vivo study, that phagocytes at inflammatory sites were not merely macrophages but a substantial number of these cells differentiated into DC upon migration to the T cell area of the draining LN. This may explain the mixed phenotype (CD83 and acid phosphatase-positive) of DC-macrophage-like cells containing myelin Ags in the cervical LN observed in our study. The observation that myelin Ag-containing cells express CCR7 suggests that these cells have migrated to the LN in a regulated manner (47). Further studies are required to determine the identity of the cells containing myelin Ags in the cervical LN. In addition to transfer in phagocytotic cells, myelin Ags in LN DC may also result from Ag transfer, i.e., uptake of Ags released by migratory cells, as shown in other systems (48, 49). Alternatively, myelin Ags may have drained to other locations, including LN, and been carried subsequently to the cervical LN. However, our data from spleens and other LN of marmoset monkeys (Table I⇑) suggests that this would apply only for myelin proteins. Although MBP and PLP can be transiently expressed in various types of leukocytes during immune-stimulatory conditions (50, 51, 52), the additional presence of neutral lipids from degraded myelin within APC in the cervical LN makes this an unlikely explanation for our findings. The presence of myelin proteins within cells in the inguinal, axillary, and cervical LN of OVA- and collagen-immunized animals may result from normal myelin turnover (53) or be explained by such de novo expression of MBP and PLP in response to the injection of CFA, which exerts strong effects on phagocytic cells (54). Collectively, the findings of the present study imply that, during EAE in marmoset and rhesus monkeys, phagocytic cells take up myelin in brain lesions, migrate to the cervical LN and the spleen, and present myelin Ags at these sites to T cells. Ample evidence is now available that there is functional specialization of individual LN from distinct anatomical sites. The cervical LN are instrumental in the induction of nasal tolerance (55), i.e., removal of cervical LN abrogated tolerance induction, which could be restored only by transplantation of cervical LN, but not of other LN. Cervical LN also play an important role in the induction of immune responses to brain-derived Ags (14, 56, 57, 58). Interestingly, Ags injected into the CNS evoke a deviant systemic immune response that is deficient in Ag-specific delayed-type hypersensitivity (59, 60). Recently, it was shown that this deviated immune response could be transferred to naive animals by cervical LN cells from donors that received an injection of Ag in the brain 8 days earlier (60). We hypothesize that, during EAE, inflammatory signals from the CNS environment prevent the induction of a deviant immune response (2, 3). The significance of cervical LN in the development of EAE is demonstrated by the finding that complete removal of the cervical LN markedly reduced the severity of cryolesion-enhanced EAE in Lewis rats (61). Moreover, there are indications that encephalitogenic T cells primed in the cervical LN may preferentially target the brain (62). The results of our study support the importance of the cervical LN in EAE in the modulation of autoreactivity. Strategies to treat MS with therapeutic Abs directed against costimulatory molecules and cytokines are currently under development (19, 63). To interfere with effector functions of T cells and macrophages, it is generally assumed that such immunotherapeutics should necessarily reach the lesions in the CNS by crossing the blood-brain barrier. However, the results of the present study indicate that the cervical LN, which may be accessible via nasal drainage and the circulation, may also serve as a local target for immunotherapy of demyelinating diseases. In this respect, it is interesting that nasal application of low doses of cytokines such as IL-10 ameliorated relapsing EAE in DA rats (64). In conclusion, the findings of the present study imply that, during MS and EAE in marmosets and rhesus monkeys, myelin Ags are transferred to the cervical LN. Subsequently, they can be presented to T cells by APC, resulting in modulation of T cell reactivity and proliferation. Future studies are warranted to elucidate the mechanisms involved. The monkey EAE models will be a valuable tool to study these mechanisms of Ag transfer and the role of cervical LN in the modulation of T cell responses during MS and may lead to the development of novel therapeutic strategies. We thank Prof. H. Lassmann and Dr. J. Bauer (Brain Research Institute, Vienna, Austria) for critically reviewing the manuscript and T. van Os for microphotography. ↵1 This research was supported by grants from the Netherlands Organization for Scientific Research (NWO-NDRF 014-80-007) and from the European Community (Biomed-2 BMT 97-2131). ↵3 Abbreviations used in this paper: DC, dendritic cell; EAE, experimental autoimmune encephalomyelitis; LN, lymph node; MBP, myelin basic protein; MOG, myelin oligodendrocyte glycoprotein; MS, multiple sclerosis; ORO, oil-red O; PLP, proteolipid protein; phMOG, human MOG peptide; rhMOG, recombinant human MOG. Cserr, H. F., P. M. Knopf. 1997. Cervical lymphatics, the blood-brain barrier, and the immunoreactivity of the brain. R. W. Keane, and W. F. Hickey, eds. Immunology of the Nervous System 134 Oxford Univ. Press, New York. Chayen, J., L. Bitensky. 1991. Analysis of chemical components of cells and tissues; reactions for lipids. Practical Histochemistry 45 Wiley, West Sussex. Claassen, E., S. H. M. Jeurissen. 1996. A step by step guide to in situ immune response analysis of lymphoid tissues by immunohistochemical methods. M. Weir, ed. Weir’s Handbook of Experimental Immunology, Vol. IV. D 204.1. Blackwell, Cambridge. Lassmann, H.. 1998. Pathology of multiple sclerosis. A. Compston, and G. Ebers, and H. Lassmann, and H. McDonald, and I. Matthews, and H. Wekerle, eds. McAlpine’s Multiple Sclerosis 323 Churchill Livingstone, London.